‘Context’, once upon a time, was a word that was considered the Holy Grail of marketers worldwide. However, as we dive deeper and deeper into the internet age, where information is boundless, context assumes a vital role in many more functions. Clearly, in this information age, context helps us decide what is credible and relevant. It also helps determine when it becomes reliable for reference. The role of context in eLearning is now no different. Without context, all information is a mere data point floating in the universe of the mind with other such data points. Knowledge only emerges as a result of connecting these dots, in context, making this vast sea of information relevant. So what role does context play in today’s eLearning landscape? Before the age of the internet, information was almost proprietary. Learning was pushed to the learner and thereby content-centred courses were the norm. Given the easy accessibility of information today, content no longer remains as prized a commodity. We can thank the Google effect for this. With content-centred learning plans becoming obsolete, eLearning providers have to now focus on what matters most today—context. With the help of context, eLearning providers can help the learners make connections between concepts and learning objectives, help them draw conclusions and relate them to their own experience and the real world. The problem with content-based learning is that it is abstract. And abstract learning cannot be transferred to different situations and it cannot be applied in the performance of different tasks. Now that I’ve set the context (pun intended), let’s review a few reasons why context must play a crucial role in today’s eLearning strategies. The objective of any learning program is to facilitate knowledge gain to increase competence. Competence is not only a matter of learning a specific piece of information, but also understanding how to apply it using critical, creative, and practical thinking. This approach helps the learner draw meaning from the content provided to them to make sense of its application. Organizations across the world are under the pressure to train their employees better and faster. And even with a plethora of eLearning technologies at their disposal, they are unable to achieve this as they are often missing the context of intended use. We are in the age of personalization. Calling it hyper-personalization won’t be wrong either. 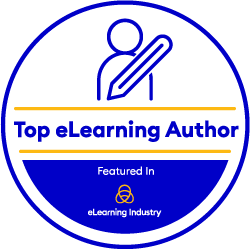 eLearning has taken personalization seriously. Tailoring the eLearning experience to suit an individual’s habits or preferences is gradually becoming the norm. Users want to consume information in bite-sized pieces—check. Users want to use a mobile for learning—check again. Users want a better interface to interact with—well, sure. Users want gaming elements for assessment—done again! Personalization makes eLearning more interactive and engaging no doubt. But how can it make it more effective? That can be achieved with contextualization—by taking into account job roles, the departments, organizational goals, the tasks being currently performed etc. Context helps in aligning the learning goals with the expected learning outcomes by making the course relevant to the user. The objective of any training or learning program is to increase the users’ knowledge to minimize the difference between a learning environment and the performance environment. Technologies such as Machine Learning and AI are helping eLearning companies make contextual training more sophisticated and on-demand. And as employee training becomes a top tool of organizations for higher productivity, it is also becoming equally essential to integrate training with organizational objectives. Training now drives employee enablement. It is for organizations and eLearning providers to apply the right context to training programs so that it provides the opportunity to increase knowledge and expand the efficiencies of the workforce. This approach gives the workforce real competence to handle real-world scenarios effectively. It is only when eLearning providers apply context to the learning materials and to all training that they can create effective learning interactions. It is context that takes something familiar and converts it into something practical and usable. And eLearning providers need to take note of this if they want to engage with their users in meaningful ways and deliver better learning outcomes. It’s no longer about what you know? It’s about why you need to know it?